The photo above is near two gate. The heavily blacked out area in the tree is a possible ALIEN STARGATE (portal). 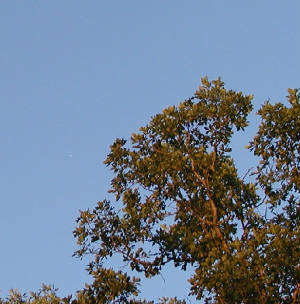 The large object to the right is the 'Alien Shuttle Craft' docked (Higher than shown in other photos) in front of another, taller tree. There are several dish antennas just this side of the 'Shuttle Craft'. As you can see the area seems to be crowded with multiple ghostly looking creatures. Many are on top of the 'Shuttle Craft'. This photo is not blurred. The area is masked (camoflaged) by the Aliens. Click on the photo for an enlargement. 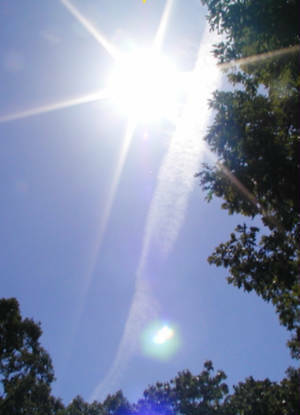 Why do so many take photos of contrails? High enough to be picked up by radar at Columbia Regional Airport if? This had been a very warm day with the high temperature just above 100 and I had stepped out on the deck just to look around. I had a passing thought to 'Take the camera'. I planned to make a few checks of the sky. 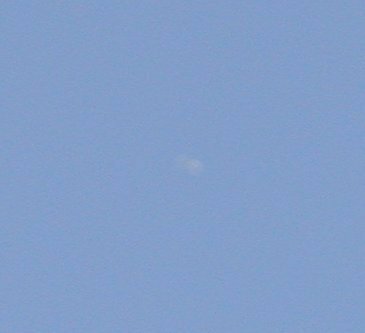 I took a few photos of what looked like empty sky, and it was. 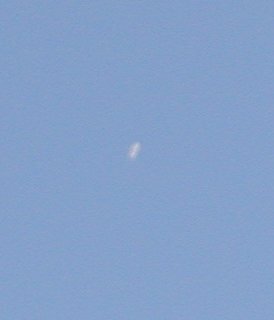 Then I waited a few minutes and just before going back in I looked up again and saw another UFO. It was similiar to those I had seen previously from this location. It was already half way across the width of the open space. By the time I could get the camera activated I only had time left for a couple of photos. The camera is an Olympus Camedia C-2100 at 2.1megapixel. I didn't use the zoom. It all happened too fast. The image I could see was much better than the ones in the photos. But I'm learning. This ship was already half way across the width of the open space in the tree canopy. The ship was solid white (no paint design) and there were no wings showing and no tail section. There were no portals or windows that could be seen from my viewing angle. There was no sound and no con trail. It was just cruising like it was in command of all it could see without fear of interception or even being seen. 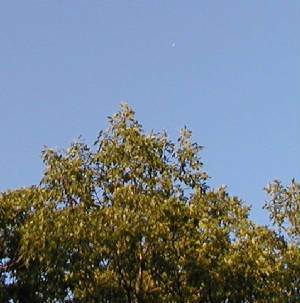 I think this brings to seven the total number of UFOs that I have seen in my life and three of those were in Jefferson City and three have been seen from the deck on the back of my house. There is definately something going on in this part of the country. The two photos of this ship are close to the bottom of the page on the right hand side. This had been a very warm day with the high temperature just above ninety and I had stepped out on the deck to see if there had been enough cool down to adjust the AC and perhaps open some windows. 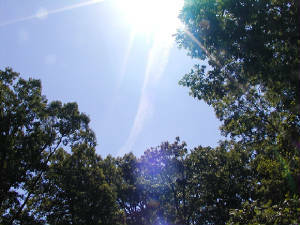 It was still to warm to turn off the cooling so I took a look at my pickup and had a passing thought to check the sky. This ship was already half way across the open space in the tree canopy and I hadn't brought a camera or binoculars out with me. I could see that the ship was solid white (no paint design like an airliner would have) and there were no wings showing and no tail section. There were no portals or windows that could be seen from my viewing angle. There was no sound and no con trail. It is odd to see these things just cruising along like they belonged there. I was spending time on the deck of my home located half way between Jefferson City and Columbia, MO. 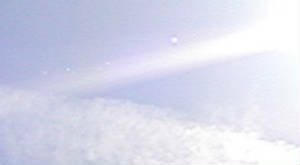 I was intentionally watching the sky thru a large hole (Appx. 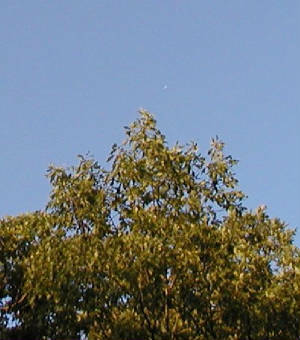 30+ yards by 20+ yards) in the tree canopy when I spotted this white UFO moving thru the blue sky. 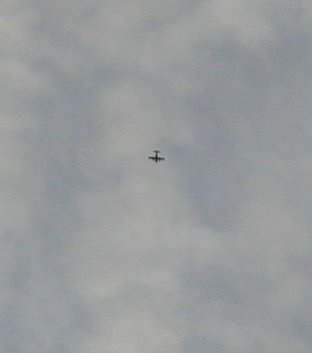 About 30 minutes later I saw a large airliner traveling from East to West at appx. the same altitude at a much slower speed (Appx. 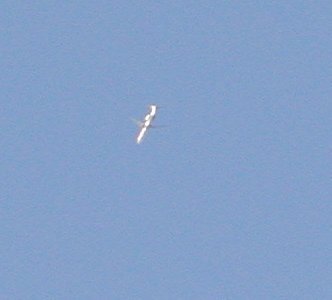 500+ MPH) than the UFO. I could easily see the different colors and the tail structure, the wings and the two jet engines, one on each wing, of the jet aircraft. Strangely!! !, these two engines seemed to be extremely large for this size aircraft. The diameter of each engine seemed to be much larger than the diameter of the aircraft fuselage. 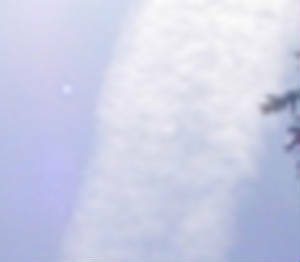 The jet did have two contrails extending to about 300 yards behind the aircraft. This gave me a good comparison between the two vehicles. * All estimates are 100% pure guesswork. 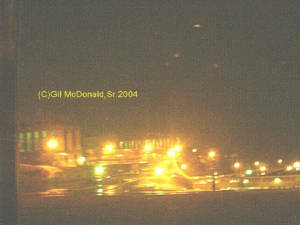 **Although there are no visible windshields or windows it is entirely possible that this type of ship is man made. 3 MILES S/W of ASHLAND, MO. 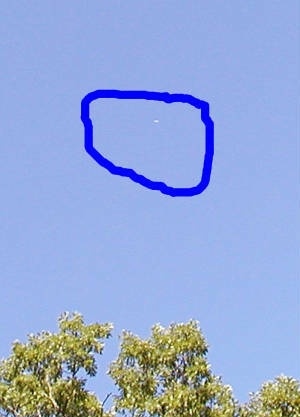 Oct. 19, 2012 at 10: AM I walked out onto the deck and saw a silver circular UFO moving from South to North. Altitude appx. 7000 feet at appx. 300mph. The ship was about the same size as many others that I have on these pages. It was just cruising along slowly then gave two spurts of speed as if it was hurrying to get out of my narrow viewing area thru the opening in the tops of the tall trees that surround my home. The ship was very visible and stood out from the background of the blue sky. I didn't have a camera with me but even if I had there was not enough time to activate the camera and get a photo. The direction was directly from the Jefferson City, Missouri area toward the area of Columbia, Missouri.